Ludovic Kennedy, the son of Royal Navy officer, Captain Edward Coverley Kennedy, was born in Edinburgh, Scotland, on 3rd November 1919. His mother, Rosalind Grant, was a cousin of Robert Boothby. Kennedy was educated at Eton College and instead of going to university he joined the Royal Navy on the outbreak of the Second World War. His father was called out of retirement and as captain of HMS Rawalpindi was killed when the ship was sunk near Iceland. Kennedy served as an officer on destroyers, including HMS Tartar. Kennedy pointed out in his autobiography, On My Way to the Club (1989) that he decided to become a writer at the age of fifteen. However, he admitted that he did not have a subject to write about. This all changed with the Second World War and in 1942 he published his first book, Sub-Lieutenant: A Personal Record of the War at Sea. In 1946 Kennedy he enrolled at Christ Church, Oxford. After leaving university he became a journalist with Newsweek. In February 1950 he married the dancer and actress Moira Shearer. Over the next few years the couple had four children (Ailsa, Rachel, Fiona and Alistair). In 1953 Kennedy joined BBC Radio. Later he was to become a well-known television journalist. Kennedy developed an interest in miscarriages of justice. He points out in Truth to Tell (1991): "When I was a boy I was told by my mother that my father had been court-martialled and reprimanded after the first war for not taking strong enough measures to suppress a mutiny of naval reservists who were under his command. She said that the verdict had been disgraceful and that the Navy as a whole thought my father had been shabbily treated." The first case that Kennedy investigated concerned a murder that had taken place in 1952. On the night of 2 November 1952, Christopher Craig (16) and Derek Bentley (19) tried to break into the warehouse of wholesalers Barlow & Parker in Croydon. The two youths were spotted climbing over the gate and up a drain pipe to the roof of the warehouse by a neighbour. The police arrived soon afterwards and when they tried to arrest them, Craig opened fire with a gun, killing one policeman and wounding another before being taken into custody. At their trial both were found guilty of murder. Bentley was sentenced to death but Craig, who had fired the shot, was too young to hang was sentenced to life in prison. The Home Secretary, David Maxwell-Fyfe, was expected to reprieve Bentley but instead he allowed him to be executed. Kennedy responded to what he believed was "contrary to all natural justice" by writing Murder Story, a play that was put on at the Cambridge Theatre in 1955. Kennedy then turned his attention to the case of Timothy Evans who was hanged in 1950. Michael Eddowes, a retired solicitor, wrote about Evans in The Man on Your Conscience (1955) where he suggested that the real murderer of his child and wife was John Christie. Kennedy wrote: "Eddowes's book was quite short, and, because he was not a professional writer, poorly assembled. Yet, by the time I had read it three times, I had no doubts about his conclusions... In order that this truth be more widely known I resolved then to write a definitive book on the case." 10 Rillington Place was published in 1961 and it has been claimed that it was influential in the abolition of capital punishment. Kennedy became active in politics as a result of the Suez Crisis. He joined the Liberal Party and he was their candidate at the by-election at Rochdale in 1958. He came second with the largest Liberal by-election vote since 1935. In 1959 he came within 3,000 of winning the seat, but decided to abandon politics in order to concentrate on journalism. Kennedy continued to work in television and was a regular contributor to This Week (1958-59) and Panorama (1960-63). In July 1963 Kennedy attended the trial of Stephen Ward at the Old Bailey. As he later pointed out: "Because of the rich and diverse characters that the case had spewed up and because also my instincts told me that this was going to be another miscarriage of justice though of a rather different kind, I attended the trial throughout, and six months later published my book on it." These characters included John Profumo, Christine Keeler, Mandy Rice-Davies, Eugene Ivanov, Vickie Barrett, Ronna Ricardo and Samuel Herbert. In his book The Trial of Stephen Ward (1964) Kennedy concluded: "...the general feeling in court had been that although there could be little doubt that Ward was a habitual associate of prostitutes there had been little in the way of evidence to justify the charges of living on their immoral earnings, which, when all was said and done, was why we were here; and the impression on the Press benches that this was really a political trial, an instrument of revenge by the Establishment for the scandal caused by the exposure of Profumo." Kennedy once described himself as someone who became "committed to revealing hidden truths". Fellow investigative journalist, Duncan Campbell, has pointed out: "Kennedy was always supportive of other, younger journalists working in the miscarriages of justice field and he frequently challenged the establishment notion that reopening such cases undermined faith in the judicial system." Kennedy continued to work as a television journalist working on 24 Hours (1969-72), Tonight (1976-78) and Did You See? (1980-88). Kennedy also developed an interest in the case where Bruno Hauptmann had been executed for the murder of Charles Augustus Lindbergh Jr., the 20-month-old son of Charles Lindbergh and Anne Morrow Lindbergh. His documentary film on the case, Who killed the Lindbergh Baby? appeared in 1982 and his book, The Airman and the Carpenter in 1985. Other books by Kennedy include Pursuit: The Chase and Sinking of the Bismarck (1974), The Crimean War: The British at War (1976), Nelson and His Captains (1976), Presumption of Innocence: Amazing Case of Patrick Meehan (1977), Hundred Years War (1977), A Book of Railway Journeys (1980), Menace: Life and Death of the Tirpitz (1981), An End to Belief? (1984), On My Way to the Club (1989), Truth to Tell (1991), In Bed with an Elephant: Personal View of Scotland (1995), All in the Mind: Farewell to God (1999), The Peninsular War (2000), 36 Murders and 2 Immoral Earnings (2003) and Mutiny at Salerno: An Injustice Exposed (2005). Kennedy's wife, Moira Shearer, died on 31st January 2006 at the age of 80. His final campaign was as a supporter of voluntary euthanasia. Ludovic Kennedy developed pneumonia following a fall in 2008. He died at a nursing home in Salisbury on 18th October 2009. What made the evidence of the prosecution at Ward's trial of such unflagging interest was the variety of the women who had been associated with him. The four on the bench could hardly have been more different: now a new star came to grace this milky cluster in the night sky. Her name was Margaret (Ronna) Ricardo and unlike Christine and Mandy she made no pretensions about not being a tart. It would be untrue to say she was not ashamed to admit it, for clearly she was ashamed or at least unhappy about it, but admit it she did. This honesty made a welcome change. She had dyed red hair and a pink jumper and a total lack of any sort of finesse; but after the genteel caperings of Christine and Mandy and the deadly respectability of Miss R, this also was welcome. We had heard of Miss Ricardo before. She had given evidence at the Magistrate's Court proceedings three weeks earlier. There, among other things, she had said that she had visited Ward two or three times at his Bryanston Mews flat (we were on to Count 3 now) and on each occasion she was asked to stay behind to meet somebody. Men had arrived and she had gone to bed with them. Since then, however, she had gone to Scotland Yard to make a statement denying this. At the moment nobody knew for certain what she was going to say. She took the oath and in answer to Mr. Griffith-Jones said that she had visited Ward at his flat in Bryanston Mews earlier this year. This, of course, was the flat where Rachman and Mandy had lived for two years. Ward had shown her the hole in the wall where the two-way mirror used to be and which Mandy in her evidence admitted to having broken. Miss Ricardo had said to Ward that she had had a two-way mirror herself. Ward had told her, she said, that he would "either cover the hole up or else get a new mirror", and she had said she had got an ordinary piece of mirror at home that would cover the gap. Now Mr. Griffith-Jones had said of the two-way mirror in his opening speech that when Ward moved into the Bryanston Mews flat "it was proposed to have it put in order again". This reply of Miss Ricardo's was the nearest he ever got to substantiating the assertion. The reader will have noticed that far from a categorical assertion of proposing to repair the mirror, Ward was undecided as to whether to cover the hole up or get a new mirror-a new mirror, note, nothing about a new two-way mirror. But how could the jury be expected to notice this? Up to this moment in the trial the general feeling in court had been that although there could be little doubt that Ward was a habitual associate of prostitutes there had been little in the way of evidence to justify the charges of living on their immoral earnings, which, when all was said and done, was why we were here; and the impression on the Press benches that this was really a political trial, an instrument of revenge by the Establishment for the scandal caused by the exposure of Profumo, was growing all the time. But with the calling of the name of Vickie Barrett this changed. For she was the witness for whom we had been waiting, the girl whom Mr. Griffith-Jones had said in his opening speech had visited Ward's flat for a period of over two months to give sexual comfort and stimulation to a variety of men for money which she had never received. Would her performance in the witness-box bear out the promises that Mr. Griffith-Jones had made of her? If it did, then as surely as the coming of night the jury would find, and rightly find, Ward guilty. She came into the witness-box, a little whey-faced blonde, wearing a sort of green raincoat with a white scarf round her neck; and when she turned to face the court and while she was giving the oath, one's impression was one of shock; shock that Ward, whom one had believed to be a man of some fastidiousness in his tastes, had sunk so low. For of all the whores the prosecution had paraded or were still to parade before us this one was the bottom of the barrel. Christine and Mandy and even Ronna Ricardo had had a certain style, a kind of robustness, which compensated for their other deficiencies, but this little waif had nothing. She was like a little sad, sick elf, a photograph, as Rebecca West later put it, from a famine relief fund appeal. Clearly no improving influences had come to grace her life, no Professor Higgins had taken her under his wing : she was, in officers' mess parlance, a ten bob knock in the Bayswater Road. I looked at her standing so awkwardly in the witness-box, and then I looked at Ward, intelligent and sophisticated, in the dock, and I found it difficult to reconcile the two. With his trademark look of wry bemusement, Kennedy laced his incisive questioning with an idiosyncratic charm that became the blueprint for a generation of journalists and a huge hit with viewers. His poise as a performer was matched by his ability to see through to the truth of a story and take a full grasp of all the issues at play, and it quickly took him to the top of his profession. After rising to early success as a newscaster for the fledgeling Independent Television News, where he worked alongside Day, he blazed a trail with investigative reporting programmes such as Panorama and Tonight. A strong moral rectitude brought Kennedy into contact not only with current affairs but also with the past. He launched campaigns to reconsider convictions in several high-profile cases, including the hanging of Derek Bentley and the jailing of the Birmingham Six and the Guildford Four. His exposés of corruption and incompetence in the police and legal systems were damningly effective, and he was ubiquitous in debates on the need for judicial reform. He was an ardent and often outspoken campaigner, also prominent in calls for the legalisation of euthanasia, castigating the Roman Catholic Church’s pro-life stance as “medieval in its thinking and barbaric in its lack of compassion”. Kennedy was already a committed atheist who saw religion as undeserving of any moral high-ground, and he first become involved in the Voluntary Euthanasia Society when his mother, Rosalind, suffering from painful rheumatoid arthritis, told him that she did not want to live any longer. He went on to become president of the Voluntary Euthanasia Society. 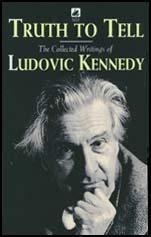 A perennially active thinker, Kennedy published a critique of religious doctrine and history of atheistic thought, All in the Mind: A Farewell to God (1999), aged 79. Without any sense of world-weariness, he attacked what he saw as the hijacking of altruism by Christianity, and made a cogent, lively case for the abstract nature of human moral value. Yet he did not dismiss the potential for spiritual satisfaction in life and was angered at the suggestion that a life without religion might be less moral. He recalled two experiences particular resonant of such spirituality in his life: as a child hearing a piper on the moors in his native Scotland; and seeing hundreds of stars, like “a watchful presence”, while standing on board a fleet destroyer at night during the war. Sir Ludovic Kennedy, the distinguished broadcaster, outspoken campaigner and committed atheist, has died aged 89 at a nursing home in Salisbury, his family said today. It is understood the former BBC presenter, whose genteel charm belied a rigorous interviewing technique that made him one of television's most successful journalists, had been in a frail condition after developing pneumonia following a fall last year. Kennedy would have celebrated his 90th birthday next month. Hanne Stinson, chief executive of the British Humanist Association, said: "Sir Ludovic was a stalwart supporter of the BHA and a progressive campaigner on many fronts. He will be sorely missed." A lifelong Liberal – he once stood unsuccessfully as a candidate – Kennedy was lauded by the Lib Dem leader, Nick Clegg, as "one of the great thinkers of his generation. His pursuit of justice and his championing of sometimes unpopular and controversial causes marked him out as a true liberal," he said. A vociferous advocate of assisted dying – one of his books is entitled Euthanasia: the Good Death – his belief in the right to die with dignity was born from watching his mother Rosalind's last, painful months. He resigned from the Lib Dems in 2001 when the former leader Charles Kennedy refused to include the issue of voluntary euthanasia in the party's election manifesto, though he later rejoined. Kennedy's uncompromising pursuit of miscarriages of justice was rooted in the unfair court-martialling of his father, Captain Edward Kennedy, who later died in action during the second world war when the merchant cruiser he commanded was sunk by a German battleship off Iceland. It was "Ludo" Kennedy's particular charm as a broadcaster that he behaved on air as he did in real life – as though he were at some informal gathering of old friends. Benign, handsome and slightly Woosterish, he conveyed the impression of being a talented amateur who had drifted into a popular medium which he regarded as somewhat beneath him. Indeed he never really lost a certain aristocratic contempt for television and dismissed as ludicrously self-important the views of those television executives who believed that "a thing said simultaneously to 15 million people will carry more influence than something said privately at a pub or dinner party or picked up elsewhere in the course of the day." Yet Kennedy combined his laconic, humorous style with a rage for justice that made him a formidable investigator. He specialised in ferreting out truth, pursuing almost-lost causes and bringing to light what seemed to him to be miscarriages of justice. Some of his television exposés were followed up with books, of which the most famous were to do with the execution of Timothy Evans (the man hanged in 1951 for murders which, it later transpired, had been carried out by John Christie), the framing of Stephen Ward in the Profumo case and, with The Airman and The Carpenter (1985), the electrocution in America of Bruno Hauptmann, the man accused, probably falsely, of being the kidnapper and murderer of the Lindbergh baby. More recently, Kennedy campaigned for the release of the Birmingham Six and other IRA suspects who, it is now recognised, had been the victims of serious injustices. Kennedy was fond of recalling Goethe's advice to "distrust all those in whom the urge to punish is strong". In 10 Rillington Place (1961), Kennedy showed how, in the Evans case, a man of subnormal intelligence had been used as a scapegoat to save people trouble. In other cases the story was of law enforcers ganging up to "frame" a scapegoat to assuage their own fears and sense of outrage. His exposure of the Evans case was said to have played an important part in turning the tide of opinion in Parliament in favour of the abolition of the death penalty. But some regretted that one effect of his campaigns on particular instances of injustice had been to undermine public confidence in the police and courts in general. Kennedy entitled his autobiography On My Way to the Club, and for all his iconoclasm he remained an insider, which is perhaps why he proved so formidable and effective a campaigner. He got things done not by alienating, but by being painstakingly reasonable and he had a ready audience among members of the Establishment, most of whom he knew personally. Despite his espousal of unpopular causes (he also championed atheism, republicanism, voluntary euthanasia and fox-hunting), none of the wrongs he set out to right left him with a hair out of place. His campaigns cost him little more than being blackballed for membership of an Edinburgh golf club and, following the release of the Birmingham Six in 1991, the friendship of Lord Lane, the appeal judge in the case whom Kennedy had urged to stand down. 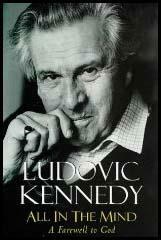 To those of us who believe that British justice is fallible, Ludo Kennedy (obituary, 20 October) was an icon. Although, these days, even some of the highest judges in the land have been known quietly to concede that the system over which they preside is capable of making mistakes, in Ludo's day few, if any, were prepared to contemplate that possibility. What's more – as the two woefully inadequate inquiries into the Timothy Evans case demonstrate – the judicial establishment was prepared to go to some lengths to avoid having to face up to the fact that something had gone horribly wrong. It was Ludo who wiped the smile off their smug faces. What made him especially effective was that he was himself an impeccably establishment figure. His Eton and Oxford education, the fact that he was a member of the same clubs and possessed of the same self-confidence as those who occupied the upper reaches of the judiciary and government, meant that he was ideally placed to take them on. And he didn't hesitate. I first got to know him more 20 than years ago, when the Sunday Times commissioned him to produce a detailed study of the Birmingham pub bombings case, which I had been pursuing for some time. In those days it was a lonely cause, but once he came on board it became considerably less so. True to form, he invited me to lunch at his club in St James's and from then on we never looked back. Much of his renown derived, of course, from his having been – along with Robin Day – a presenter in the early days of television. I didn't realise how famous he was until I invited him to dinner at the House of Commons, only to find him being buttonholed by a procession of people, from members of the then Tory cabinet to the waiters in the dining room. Ludo's strength was that, unlike some members of the great and the good, once he had alighted upon a just cause, he stayed with it to the end. Witness his pursuit of two cases concerning murders that took place in 1969 – that of Patrick Meehan in Scotland, and that of David Cooper and Michael McMahon, which was referred to the court of appeal a record four times. One of my abiding memories of Ludo was sitting next to him, day after day, in the jury box at the Old Bailey (which had been set aside for "distinguished" observers) during the final appeal of the Birmingham Six, sharing Polo mints and sardonic asides. He once recounted an encounter with the then lord chief justice, Geoffrey Lane, who claimed to have seen him on a golf course in Scotland. "Not me, I wasn't there," replied Ludo. Adding cheekily, "a case of mistaken identity". A concept which, of course, Lord Lane had some difficulty in accepting.